We at AJE at are all about elevating parent voices! That is why we are delighted to share that our very own Chioma Oruh and LaJoy Johnson-Law had a Local Opinion piece published in the Washington Post over the weekend! Parent voices are a vital, if often underrepresented, part of the education policy conversation; this is especially true for the families we serve at AJE, who are often struggling to access needed supports and services. We are proud that two members of our team shared their experiences, and the experiences of other DC families, and explained why transparency in the use of public funds for education is so important. You can find out more about this issue in this City Paper article or at the DCist. Your voice matters too! We have two opportunities coming up about how you can include your voice in the local and national policy conversation! First on, Thursday, April 11th from 5-7pm, Turning the Page will lead a two-hour DC School Report Card “train the trainer” session at Martha’s Table – The Commons, 2375 Elvans Rd SE, Washington, DC 20020. The session will equip stakeholders to develop an understanding of the data and information on the DC School ReportCard and conduct conversations on improving and sustaining strong schools in their communities. Participants will be trained on how to navigate and utilize the DC School Report Card, in preparation to lead their own school and community-based conversations. Following the workshop every parent will receive a $25 Grocery Gift Certificate and free books! To RSVP for the session please sign up here ( https://dcschoolreports.eventbrite.com). 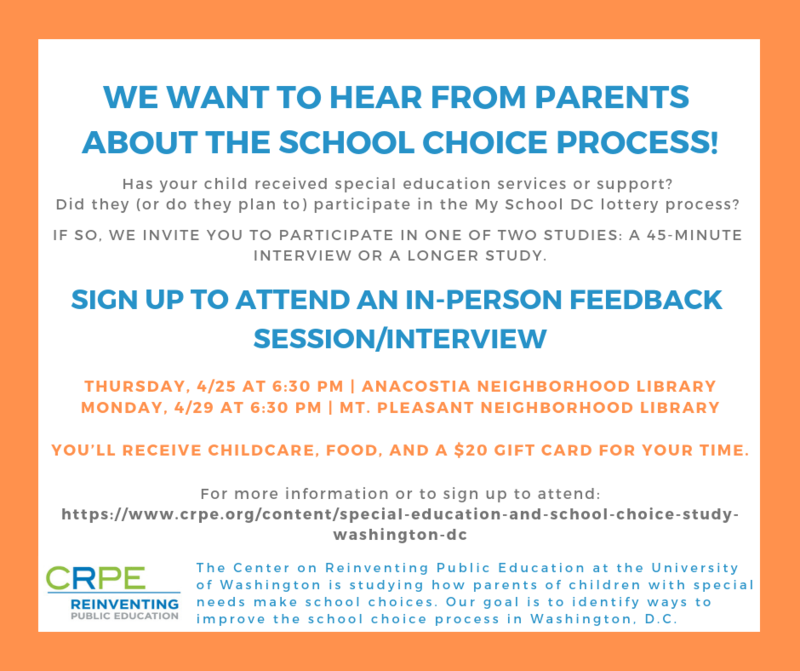 Also, the CPRE (Center for Reinventing Public Education) at the University of Washington want to hear from DC families about their school choice experience.